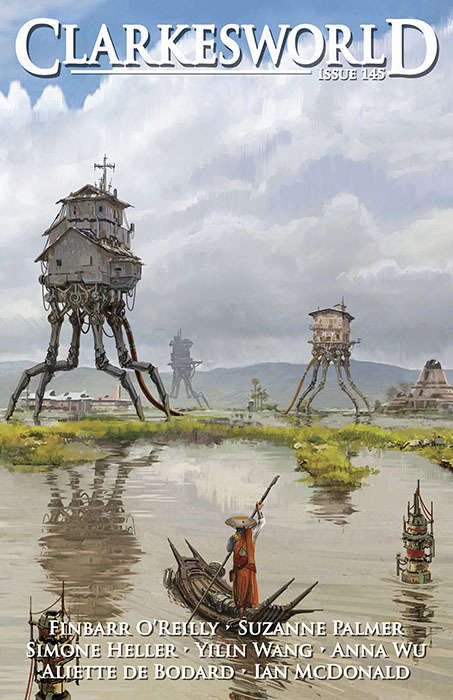 "The Miracle Lambs of Minane," by Finbarr O'Reilly [bio] (edited by Neil Clarke), appeared in Clarkesworld issue 145, published on October 1, 2018. Pro: It’s a compelling account of what it might be like living in a community decimated by an ecological disaster but starting to recover. The mention of people who remembered when Ireland was home to millions, not thousands, is particularly chilling. Con: The narrator is just doing a job; she has no real impact on the action. Dr . Verane is the real protagonist, but she’s mostly a mystery to us, even at the end. I'd argue that the story is appropriately told from the narrator's POV - it's in part about the making of a folk hero, so the perspective of someone who knew her as a person and then as a legend is the right one. The narrator has enough of a part in the action to keep me reading. Also, Dr. Verane isn't _that_ mysterious - it's pretty clear that she is performing abortions, which puts her in conflict with what appears to be a repressive theocratic state. I agree with the three-star rating but would give this an honorable mention. On reflection, I think you're right. I upped it to honorable mention. As for Dr. Verane, yes it was obvious what she was doing, but we got no insights into why or into what sort of person she was. forgot to add: one of the folk uses of silphium was as a contraceptive and abortifacient. Are you sure the narrator is a young man? I don't think their gender is specified at any point and their interactions with Grace, particularly when finding out Grace is pregnant, gave me the impression that the narrator may be a woman. Yeah, right at the start: "The parties . . . allowed solid rural women to meet observant city boys . . . . I had been to a few such events, but . . . the women were not to my taste." Unless the author is trying to deceive us, the narrator is a city boy. The narrator is a woman. Okay, but how can we conclude that from the story? And what about the statement I quoted? Was that a mistake? To confirm that you're the author (hope you don't mind), you and I exchanged e-mails last October. Do you remember the topic? Hi Greg, I'm not sure who would want to impersonate me, but I guess it's the internet, so we talked about giving the two stories you had reviewed a series name. It wasn't a mistake - in a theocratic regime repressive enough to imprison or kill abortionists, it stood to reason (to me at least) that it wouldn't welcome non-hetero relationships either - the story was prompted by Ireland decriminalisng abortion last year, but it only decriminalised homosexuality in the early 1990s. Therefore it made sense to me that the narrator would conceal her sexuality at the time of the story, but refer to it obliquely in its retelling - "...the women were not to my taste". As for how you could conclude that from the story, I can only respond that Diego did exactly that, which is what prompted my response. I hope that clarifies things. Thanks. Fixed. I'll just say that, as a gay guy, I would never consider attending a religion-sponsored event meant for straight couples to meet each other. Not with the idea of finding someone like-minded anyway. I could see it if the person were trying to make people think she was straight, but in that case, the appearance of the other women would be immaterial. More broadly, although I know there's a trend for authors not to "ground" their characters (that is, not to describe them for readers), that doesn't mean I like it very much. At a minimum, it makes it harder to relate to the character. At the worst, it distracts the reader from the story. Or so it seems to me.